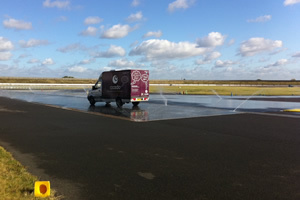 Last Thursday we celebrated our annual Driver of the Year awards at the famous Rockingham Raceway in Northamptonshire. The awards recognise safe driving, with entrants whittled down over the year according to strict criteria. All delivery drivers (or CSTMs – Customer Service Team Members), HGV drivers and marshals are entered in December, and by the summer, those left in the competition take part in a road safety quiz. The highest scorers are then invited to the awards to show off their skills. The day ends with a champagne reception and four-course meal, before a nail-biting announcement of the winner. This year, the title went to Darren Morse. Congratulations! Thank you to the sponsors who made the event possible. These were: Mercedes Benz, S&B Commercials, Michelin Tyres, Penaltex and Blue Fin. This entry was posted in Talking Ocado and tagged awards, Driver of the year, road safety quiz by Ocado. Bookmark the permalink.